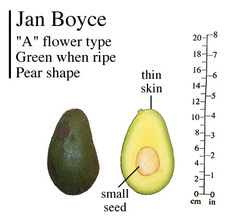 Julie Frink, a USA volunteer at the University of California South Coast Field Station considers the Jan Boyce variety as a particularly fine tasting fruit, perhaps a 'gourmet avocado'. Frink struggles to put into words how much she cares for the Jan Boyce. "There's nothing like it," she says. Focht cuts one open, revealing the tiny seed, the size of a large marble. I hope this variety could fill our void for avocado fruit in February to March with quality fruit. At least that is the idea. September 29, 2012: My tree (below) is small and I don't know if I will have bud wood to top work a tree in January of 2013, If I can get two pieces of bud wood it could work. It is flushing right now and probably would be the last flush of the year. The fastest way to test a variety is to top work an older tree in 24 month you have a good picture of what the tree would do in an area. January 13, 2013: Seems like the Jan Boyce will stay in the pot until later on this year. Has been removed from the fabric pot into a 5 gal plastic pot. March 22, 2013: As soon as I got it out of the fabric pot it double in size. Will have to wait for next year to get top worked unless one tree I cut about 6 weeks ago generates nice water shoots. April 14, 2013: I'm pushing the envelope. I top worked a tree with some of the bud wood. The water shoots were really soft and watery but I placed two pieces in two shoots. Hope it works. April 20, 2013: I added 2 more pieces to the tree in 6 more days the water shoots got a bit harder. May 4, 2013. The 4 pieces of bud wood seem to be pushing through the parafilm and are growing. Let's hope a couple will survive. As it gets hotter they could wilt in a few days of intense sun and heat. May 18, 2013: All 4 grafts are growing well. They have 3-4 inches of new growth so the plastic tape was removed. June 12, 2013. Incredible from Last picture on May 4 to now the grafts are close to 24 inches tall. July 11, 2013: More incredible is the difference of this tree in 30 days. Its growing very well. February 14, 2014: The tree is doing great, does not seem to be a big tree. There are some expanding inflorescence. We may see a fruit or two. See pictures. March 24, 2014: The trees has flowered and is about 75% done with flowers but have not seen any fruit set. April 17, 2014: The tree knows best its too small to carry fruit. I see about two the size of peas. Should do good next year. July 4, 2014: No longer fruit size peas at least one fruit is growing may be the only one left in the tree. See Picture. March 9, 2015: The only fruit set last year I did not get to try. Fell off and was eaten by the local fauna. Now the tree is in full bloom but I only see one fruit . March 13, 2015: Seems like the tree will set a nice amount of fruit. May 20, 2015: The tree is holding quite a fruit set. The fruits are growing slowly. Little to no fruit drop. Seems like we will taste it this year. The tree is growing slowly but nicely. September 19, 2015: The tree is holding 4-5 fruit. I picked the one shown in today's picture came in at 8.8 oz. I think this is about the size they grow. Let's see if it ripens. The tree has some issues, around the bottom seems to have some wilting branches 4-5 feet above ground. I don't think is disease, looked more like herbicidal boom accident. In any event I injected it with my phosphorous Acid and nutritional formulation in July 1, 2015 and the tree is looking a lot better. September 28, 2015: The one picked in September 19, 2015 was ready. It ripened well and even some small subcutaneous disease but not much. Probably was ready two days ago. It is a massive little solid avocado, very small seed. The taste was excellent just as good as a store bought Hass. At least in Homestead this will be a September fruit. Not sure if it is worth growing a tree with this very small production. I can just imagine how good this would taste in a climate that would allow the fruit to hang on the tree another few months. See today's pics. ​January 16, 2017: The tree has been struggling in this area, no producing, some branch wilting. I decider to re top work the tree with one of my producing varieties.